The facility offers full board and the accommodation on site, which also includes use of the sea-side sauna. For more information, please visit https://www.helsinki.fi/en/research-stations/tvarminne-zoological-station. TMF participates in the Joint Mesocosm Experiments – JOMEX: Systems responses to a pulse of dissolved organic carbon (DOC). Project lead: Joanna Norkko. 24 June – 19 July 2019. The study aims at investigating the system’s responses to a dissolved organic carbon (DOC) pulse from terrestrial sources as a part of the JOMEX-experiment of Aquacosm, which will demonstrate the ability of the consortium to perform joint, directed experiments along gradients from the Arctic to the Mediterranean and from freshwater to full marine systems. Such joint experiments will allow disentangling site-specific effects from general effects of experimental manipulations and thereby increase its predictive power. TMF (maintained by Tvärminne Zoological Station), located in the Western Gulf of Finland (Baltic Sea), specifically covers the brackish water environment in this gradient approach. The core experiment of the JOMEX sites will include a highly standardized DOC source (HuminFeed; HUMINTECH, Grevenbroich, Germany; added as an initial pulse-treatment, 2 mg/l) and a control treatment (3 replicates each). In addition, we plan to include N/P addition as well as a combined N/P and HuminFeed treatment (3 replicates each). At least two weeks will be allocated to running the experiment; we have also reserved time for preparatory work, as well as sample processing and analyses after termination. A total of 360 working days can be allocated to the experiment, with an estimated number of 12 TA users. The mesocosm units consist of floating bag-type enclosures developed in collaboration with the other JOMEX sites, moored in a pelagic area in close vicinity to the facility. We will investigate the response of plankton communities (bacteria, phytoplankton, zooplankton) to the treatments, as well as nutrient and other physico-chemical dynamics is the mesocosms. The laboratory facilities allow for a range of standard marine measurements, and TA users are invited to propose measurements. 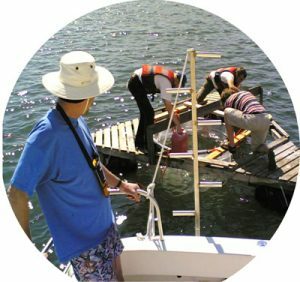 For measurements in the mesocosm units, probes for standard oceanographic measurements, as well as a range of sampling devices are available; the TA also includes provision of boats for sampling. In situ and background data from automated measuring devices and manual monitoring are available from the mooring site. TMF warmly invites a variety of user groups, not only from the scientific community, but also e.g. from SME:s. We especially envisage that the experiment forms a suitable testing ground for new instrumentation for oceanographic measurements. As we will also have TA provisioning for setting up similar, independent experiments (including ship-time for mooring), we also strongly advice users to take the opportunity to join the JOMEX-experiment and hence learn to know the facility and methodology. TA-users are welcomed to plan their own bag-experiments utilizing the framing and mooring systems available at TFM. The working days and user numbers are shared with the JOMEX-experiment above (in total 360 days and 12 users). In 2018 the Tvärminne Mesocosm Facility is open for external users wanting to conduct their own mesocosm experiments, although the scale of these experiments may be up to some hundreds of liters per mesocosm units, i.e. smaller than the full-scale, joint mesocosm experiment planned for 2019. The main mesocosm effort will focus on the joint experiments in 2019 (WP9). We particularly encourage AQUACOSM approved user groups to use the facilities for, e.g. testing new instrumentation and methodologies in a brackish environment. Depending on the size of the group, access can be offered throughout the year (negotiation). We have on average 120 TA-person days allocated in 2018, thus we could host e.g. 2-4 persons for 30 days. We offer access to mesocosms, laboratory facilities and vessels for deploying and sampling mesocosms, sampling equipment, and SCUBA diving facilities. Logistic support can be offered both for setting up mesocosms and sampling. Depending on the requirements of the specific TA project, temporary field mesocosms (plastic bags deployed in the sea) can be deployed in a range of sizes (typically not larger than 300 L) and a range of habitats (sheltered to exposed, shallow to deep). Indoor facilities are available for flow-through experiments using mesocosms up to 100 L, and outdoor experiments using plastic land-based containers can also be set up. It is also possible to utilize the indoor 300 L mesoscale experimental units owned by the SYKE-MRC Mesocosm Facility, which can be transported to Tvärminne (the use of these units must be negotiated with SYKE). 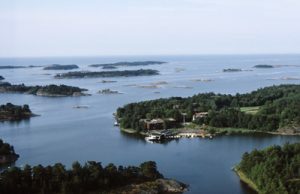 Also the joint SYKE & Tvärminne phytoplankton culture collection, including hundreds of species strains, can be used in experimental work. 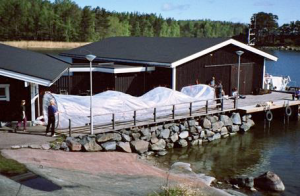 The Tvärminne Mesososm Facility (TMF) is the largest marine mesocosm facility in Finland located at Tvärminne Zoological Station (TZS). Located in a 600-ha nature reserve at the entrance to the Gulf of Finland in the northern Baltic Sea, the facility benefits from access to a large area of coastal brackish water characterised by low levels of pollution and physical disturbance. TMF has the facilities and the long-term experience to routinely set up flexible mesocosms of up to 50 m3 volume in the field (Fig. 6.15.1). There are excellent background data to support mesocosm experiments addressing impacts on long-term environmental change. Cold winters make the site an excellent place for studies on the importance of sea ice. Well-equipped laboratories, several research vessels, sampling equipment, diving facilities, experimental aquarium facilities and long-term databases are also available on site. A number of large mesocosm experiments have been conducted at TMF since 1988. Research topics have ranged from relationships of biodiversity and ecosystem functioning to links between eutrophication and algal-bloom dynamics, effects of climate change and other human-induced environmental changes on marine species, and the importance of sea ice in coastal marine environments. A total of at least 360 person-days and 150 h of ship time will be allocated to external users through AQUACOSM Transnational Access provision in years 2-4. Access to a minimum of 4 persons is offered for an average of 30 days each year. The duration of typical experiments is 2-5 weeks. 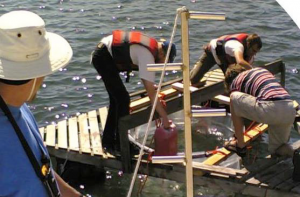 Users also have access to small boats and equipment for sampling mesocosms, to a larger vessel to deploy them, and to labs equipped with standard equipment and disposables. As mesocosms are specifically designed for each experiment, they can be made and deployed in a range of sizes and habitats (sheltered to exposed, shallow to deep) depending on user needs. Costs will be declared on the basis of a combination of Unit and Actual Access Costs, the latter covering specific support needed from UH-TZS staff (27 € and on average 344 € per user day, respectively, and 106 € and on average 57 € per hour of ship time, respectively). Services currently offered by the infrastructure: TMF offers access to mesocosms, lab space and vessels for deploying and sampling mesocosms, sampling equipment, and SCUBA diving facilities. Logistic support can be offered both for setting up mesocosms and sampling. In addition, there are aquaria and other indoor facilities for sample incubation under controlled temperature and light regimes. Running sea water is supplied at rates of up to 100 000 m3 daily. Weather data can be obtained from a weather station on site. Given that 250-300 scientists, 30% of them international guests, work about 5500 days per year at TZS, a range of laboratories for chemical and biological analyses and microscopy are available. This includes a radioisotope lab. Laboratory analyses for standard physico-chemical analyses can be provided and various analytical instruments, including a mass spectrometer, are available for additional analyses. Training in the use of equipment and techniques is provided upon request. A new research vessel, a catamaran 16 m long, will be operational in 2018. Mesocosm experiments at TFM can involve large groups of researchers, because the size of the mesocosms enables repeatedly large sample volumes and accommodation on site can be offered for over 80 guests. Support offered under AQUACOSM: Users supported by AQUACOSM TA will have access to lab space, the equipment and services listed above, standard disposables and administrative and logistic support as agreed upon in a user-access contract. Staff will provide training in the use of the facilities where necessary as well as information on historic data, on-going studies and site specificities (e.g. species distributions and phaenology, habitat characteristics). Technical support can include a boat driver and field and laboratory technicians. Other amenities include lodging and in-house lunch restaurants. This support to visiting scientists is standard operational procedure.